Here are a couple of books which have floated through my mailbox of late, all from Scholastic Books. I realized recently that I've featured children's books less and less around these parts. I'll have to rectify that situation. I've been thinking about sharing the books which we purchased for our home collection and enjoy with great regularity. Soon. In the meantime though, here are a couple of new titles for consideration. Walter the Walrus is playing a game of hide-and-seek with his father in the book Are You My Daddy? . Their game takes them around the zoo and through various animal exhibits. Walter is trying to find his daddy, of course, and keeps mistaking his mustache for another animal's bushy eyebrows, shaggy mane and/or furry goatee. In short, it's a cute story about a father and son playing together and who doesn't like that? Bonus points for this book being the interactive sort. There are pages to turn out, slide features (you can move the penguin in and out of his home), or pet the goats fluffy beard. The first time I opened this book to read it to Bookworm4 (age 2) he totally cracked up over the penguin. This book is definitely a favorite. 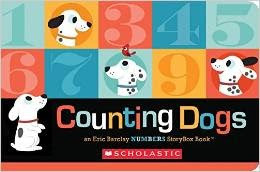 This is a cute book to encourage counting skills, but don't pick it up if you are interest stems from the cute puppies featured on the front cover. Many thanks to Scholastic Books for sending the above titles my direction in order to facilitate this review. I received no additional compensation and all options are 100% my own.